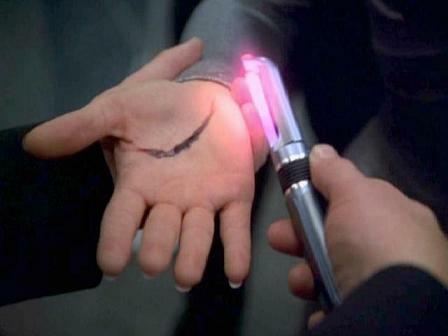 The Cellular Regenerator or Dermal Regenerator is a device on Star Trek capable of speeding up the healing process of living tissue by using light. A lot of the technology we now take for granted was actually inspired by Star Trek. And when i first saw the dermal regenerator on Star Trek i thought that this doesn’t seem too far fetched. Turns out I was quite right. Fittingly It’s a technology developed by NASA that is now being adapted to do just that. Now it might only be a matter of time before every hospital has one, heck maybe even every household. The need to care for a population with chronic wounds is a growing challenge that requires innovative approaches. Two approaches that specifically address the identified pathophysiological processes involved in wound healing are hyperbaric oxygen therapy and light therapy. Light Emitting Diodes (LED-technology), originally developed for NASA plant growth experiments in space, show promise for delivering light deep into tissues of the body to promote wound healing and human tissue growth. In this paper we review and present our new data of LED treatment on cells grown in culture, on ischemic and diabetic wounds in rat models, and on acute and chronic wounds in humans. Results include: in vitro increases of cell growth of 140-200% in mouse derived fibroblasts, rat derived osteoblasts, and rat derived skeletal muscle. Increases in growth of 155% -171% of normal human epithelial cells in vitro. Wound size decreases of up to 36% in conjunction with HBO in ischemic rat models. Improvement of greater than 40% in musculoskeletal training injuries in Navy SEAL team members. Decreased wound healing time by 50% of crew members aboard a U.S. Naval submarine. And finally, up to a 47% reduction in pain of children suffering from oral mucositis. We believe that the use of NASA Light-Emitting Diodes (LED) for light therapy will greatly enhance the natural wound healing process. This work is supported and managed through the NASA Marshall Space Flight Center – SBIR Program. Cumulative results of data from 11 patients showing improvement in range of motion, pain, and girth reported as % change from chronic, unimproving injured baseline after LED treatment at 10mW/cm2. We’ve actually known that this is possible for some time, but first now are considerable advances in this technology being made, which is very promising. Laser light and hyperbaric oxygen have been widely acclaimed to speed wound healing of ischemic, hypoxic, and infected wounds (Conlan, 1996). Lasers provide low energy stimulation of tissues which results in increased cellular activity during wound healing (Beauvoit, 1994, 1995). These activities include collagen production and angiogenesis (Abergel, 1987). Hyperbaric oxygen therapy, which is currently standard therapy in the treatment of diabetic ulcers, graft failures, radiation necrosis, and other ischemic wounds, has also been shown to beneficially affect these processes. However, there are a variety of instances in which a patient who may benefit form hyperbaric oxygen is unable or unwilling to be treated in a high-pressure environment. These situations include lack of access to a facility equipped with hyperbaric oxygen, claustrophobia, and certain current or chronic medical conditions which would make hyperbaric oxygen therapy contraindicated. In these instances light therapy provides an option for the patient. Lasers, however, have some inherent characteristics which make there use in a clinical setting problematic, including limitations in wavelength capabilities and beam width. The combined wavelengths of the light for optimal wound healing cannot be efficiently produced, the size of wounds which may be treated is limited (due to laser production of a beam of light; a fact inconsistent with treating large areas), heat production from the laser light itself can actually damage tissue, and the pin-point beam of laser light can damage the eye. NASA developed LEDs offer an effective alternative to lasers. These diodes can be configured to produce multiple wavelengths, can be arranged in large, flat arrays (allowing treatment of large wounds), and produce no heat. It is also of importance to note that LED light therapy has been deemed a nonsignificant risk by the FDA; thus FDA approval for the use of LEDs in humans for light therapy has been obtained. Next: Ojai Valley Inn "Our Green Promise"
very little scarring. Irony: had to take it apart because the components were needed elsewhere. Can probably rebuild it easily enough but used three different wavelengths at the same time. Hint: the right sort of LEDs look orange-red not red, even at low power. eye-safe this setup unless it has some sort of container with a venetian blind or similar.